India’s education sector is one of the largest sunrise sectors in the economic and social development of the country. With more than 1.5 million schools — 1.1 million of them run by the Government — and more than 250 million student enrollments, the country’s K-12 school system is among the largest and most complex in the world. Between 2010-11 and 2015-16, the number of private schools raised by 77,063 nationwide, a growth of 35 per cent, more than six times the growth of Government schools (12,297) which is a measly one per cent. In the same period, enrollment in Government schools decreased by 13.1 million whereas it increased by 17.5 million in private schools. 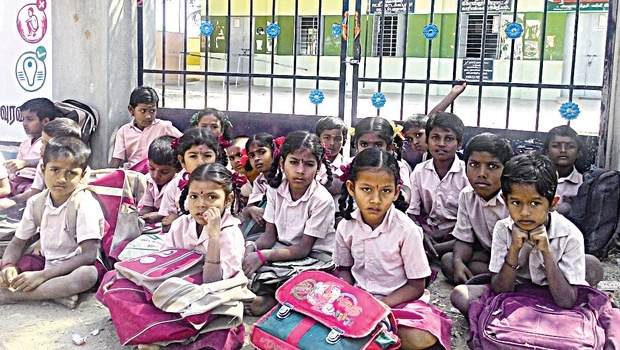 The amount the Government spends on education increased by just 0.2 per cent of Gross Domestic Product (GDP) since 2010.iAll these, despite the introduction of Right to Education Act (2009), according to which all those enrolled are retained in school till they complete their elementary education. This is popularly known as no-detention policy implying the students are automatically promoted to the next higher class. The skewed priorities of the Government in this vital sector manifest low learning levels. The Sustainable Development Goals include a commitment to provide every child with an access to free primary and secondary education by 2030. While we are on the right course, our obsession with universal coverage of education has compromised the quality of learning. It is time that India moves beyond a singular focus on enrollment numbers and grapples with the problem of poor quality. The usually parroted reasons for the poor standard of education are: Teacher absenteeism, poor student attendance, bad infrastructure, inadequate teacher preparation programmes and rote learning practices. The most common refrain is: “The ones who understand education are not empowered while the ones empowered have no idea about education”. While these issues are valid, they do not fully explain the learning crisis apparent in our classrooms. The fragile foundation of basic education augurs a dim horizon for India’s future human capital. The students are not able to learn the basics of reading, writing, and do not meet even elementary mathematics standards. The Annual Status of Education Report 2017 covering 14-18 age group has revealed that over one in two students could not do a simple division, 24 per cent could not count currency correctly, 44 per cent could not add weights correctly in kilograms, 14 per cent could not recognise an Indian map and some 36 per cent couldn’t name the capital of India. While 79 per cent could name their native state, 58 per cent could not spot it on a map and 46 per cent didn’t know the Capital. More than 40 per cent couldn’t tell hours and minutes from a clock, nearly 47 per cent 14-year olds could not read a simple sentence of English. It is not just English; 25 per cent could not read basic text fluently even when it was in their own languages. More Indian children are in school today than before but the quality of public schools has sunk abysmally as Government schools have become the reserve of children at the very bottom of India’s social ladder. The present-day education reformers believe that market solutions and technology can remedy the situation. They blame the proponents of status quo of failing to leverage the benefits that technology has brought to other sectors such as health, travel, financial services and communications. Many of them advocate disruptive innovations, primarily through online learning. There is a strong belief that real breakthrough can come only through transformative power of technology. However, findings suggest that this strategy has not lived up to its hype and with valid reason. We need certainly to be wary of the idea that technology on its own can revolutionise education. Teachers are and always will remain the most important factor in pupils’ success. The pupils need to believe that they have a stake in the future, a goal worth struggling for if they are going to make it in school. Education should combine just the right amount of physical adventure and intellectual stimulation. The most effective approaches are those that foster bonds of care between teachers and their pupils. The process of teaching and learning is an intimate act that neither computers nor markets can replicate. The bane of the modern examination system is its regressive testing regimen which we stubbornly refuse to reform. Exams are not a test of learning or intelligence or recall. They are an awfully pernicious, hazing ritual designed to produce compliant drones who can regurgitate facts faithfully. What we test is the acquisition of a narrow collection of facts, not whether children have the skills for a fruitful employment. Children are being coaxed into learning merely to pass tests. School doesn’t foster a love of learning. Nor do they inculcate the all-round skills they need when they leave the portals of learning to the world of competition. Real education is more about reading, deep thinking and asking questions rather than simply reproducing crammed answers faithfully. Formal teaching needs to be supplemented by in-school pull-out programmes, after-school tutoring and summer camps supervised by NGOs with emphasis on non-conventional innovative pedagogies. Much of the malaise in the realm of public education has less to do with salaries and more to do with lack of accountability and corruption in recruitments and transfers of teachers. The stark reality is that India is not getting even a modest return on its investment in the education sector. Teachers’ salaries in Government schools are relatively high in India at three times per capita income compared to China, where it is about the same as per capita income. But learning outcomes are better in private schools where average teacher salaries and costs per student are less. A break-up of Government spending shows that only 0.8 per cent goes towards capital expenditure, while 80 per cent goes towards teachers’ salaries, leaving little to be spent on infrastructure. The fourth Industrial Revolution is going to be a major test for the education system focused on reciting facts and performing formulaic calculations — precisely the areas where humans cannot compete with intelligent machines. With all of our technological developments, human ingenuity and creativity remain unmatched. We should capitalise on it and give our young people the opportunity to use their innate advantages as effectively as possible.